Updated 4/15/19: FEMA issued an update to a Presidential Major Disaster Declaration for areas in Iowa affected by severe storms and flooding beginning on March 12, 2019 and continuing. Updated 4/15/19: FEMA issued an update to a Presidential Major Disaster Declaration for areas in Nebraska affected by a severe winter storm, straight-line winds and flooding that took place March 9 to April 1, 2019. Updated 4/10/19: FEMA issued an update to a Presidential Major Disaster Declaration for areas in Nebraska affected by a severe winter storm, straight-line winds and flooding that took place March 9 to April 1, 2019. Updated 4/8/19: On April 8, the VA issued a circular that expresses concern about VA home loan borrowers affected by floods in Nebraska, and describes measures mortgagees may employ to provide relief. Updated 4/5/19: The U.S. Department of Housing and Urban Development (HUD) announced the approval of disaster assistance for the state of Nebraska and will provide support to homeowners and low-income renters forced from their homes in areas affected by severe winter storms, straight-line winds, and flooding. Updated 4/5/19: The U.S. Department of Housing and Urban Development (HUD) announced that it will speed federal disaster assistance to the state of Iowa and provide support to homeowners and low-income renters forced from their homes in areas affected by severe storms and flooding. Updated 3/30/19: FEMA issued an update to a Presidential Major Disaster Declaration for areas in Nebraska affected by a severe winter storm, straight-line winds and flooding beginning March 9, 2019 and continuing. Updated 3/29/19: The U.S. Department of Veterans Affairs (VA) issued a circular that expresses concern about VA home loan borrowers affected by severe storms and flooding in Iowa and describes measures mortgagees may employ to provide relief. 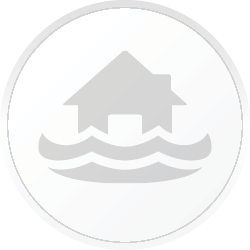 Updated 3/27/19: Fannie Mae issued a news release reminding homeowners and servicers impacted by flooding across the Missouri River Basin of available mortgage assistance options. Updated 3/27/19: Freddie Mac issued a news release reminding mortgage servicers of its disaster relief policies for borrowers affected by flooding in the Midwest. Updated 3/25/19: The Office of the Comptroller of the Currency (OCC), the Board of Governors of the Federal Reserve System, the Federal Deposit Insurance Corporation, the National Credit Union Administration, and the state regulators issued a joint statement encouraging financial institutions operating in affected Midwest flood areas to meet the financial services needs of their communities. Updated 3/23/19: FEMA issued a Presidential Major Disaster Declaration for areas in Iowa affected by severe storms and flooding beginning on March 12, 2019 and continuing. Updated 3/21/19: FEMA issued a Presidential Major Disaster Declaration for areas in Nebraska affected by a severe winter storm, straight-line winds and flooding beginning March 9, 2019 and continuing. Updated 3/21/19: Governor Kim Reynolds requested an expedited FEMA Presidential Major Disaster Declaration for areas in Iowa affected by severe storms and flooding beginning on March 12, 2019 and continuing. Updated 3/21/19: Missouri Governor Michael L. Parson issued a statewide emergency declaration as a result of severe weather and river flooding beginning on March 11, 2019 and continuing. Updated 3/20/19: The Weather Channel issued a report outlining initial Midwest flood damage estimates. Updated 3/20/19: Governor Pete Ricketts requested an expedited FEMA Presidential Major Disaster Declaration for areas in Nebraska affected by flooding, rain, high water, wind-driven rain, hail, lightning, straight-line winds and winter storms beginning on March 9, 2019 and continuing. Updated 3/20/19: The Nebraska Emergency Management Agency (NEMA) announced additional counties covered under an emergency declaration. Updated 3/19/19: The Weather Channel issued a report offering an update on extreme river flooding affecting the Midwest. 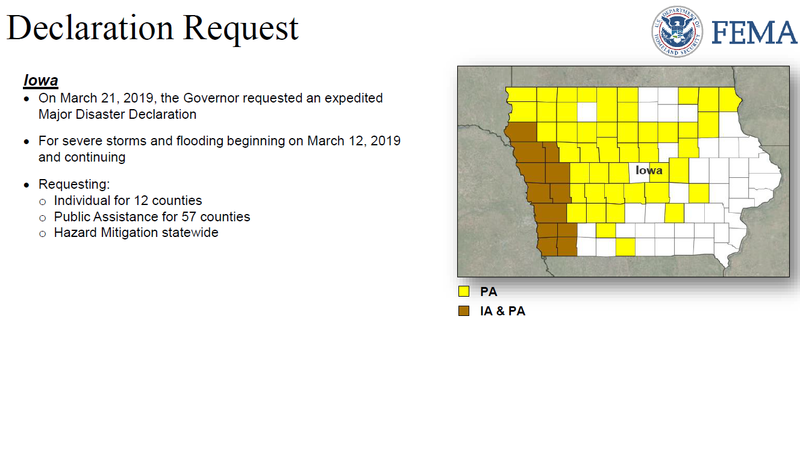 Updated 3/19/19: Iowa Governor Kim Reynolds issued a supplemental emergency proclamation adding five additional counties impacted by flooding and flash flooding. Updated 3/19/19: The Nebraska Emergency Management Agency (NEMA) announced additional counties covered under an emergency declaration. NOTE: This is independent from any FEMA Disaster Declaration. NOTE: The above declarations are independent from any FEMA Disaster Declaration. Flood warnings and advisories remained in effect Sunday evening across eastern Nebraska, southern Wisconsin and parts of Iowa. The NWS said major flooding was expected to continue across the region as late as Wednesday. Nebraska Emergency Management Agency said Sunday it was monitoring 17 flood locations across the state and expected more record crests in the next 24 to 48 hours. Also on Sunday, Iowa Gov. Kim Reynolds said 38 counties have received a disaster proclamation and more than 110 homes were damaged by floods in the western city of Hornick. She and the governors of Nebraska and Wisconsin all declared states of emergency.